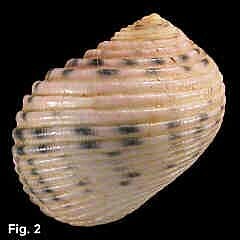 Description: Shell with low spire, width equal to or less than height. Sculptured with about 16 strong spiral ribs. Columellar deck lirate, columella convex, with three strong denticles centrally. Outer lip with large denticle at top, another at bottom, with 3-4 elongate denticles between. Exterior dull, white, fawn or pink, ribs sometimes spotted with black. Columellar deck white, aperture white. 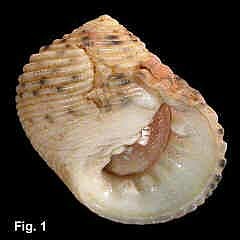 Operculum calcareous, brown. Size: Up to 30 mm in height. Distribution: Indo-West Pacific; in Australia, Houtman Abrolhos, WA, around northern Australia to Woolgoolga, NSW. Habitat: Intertidal on rocky shores. Abundant in the tropics, uncommon in NSW.